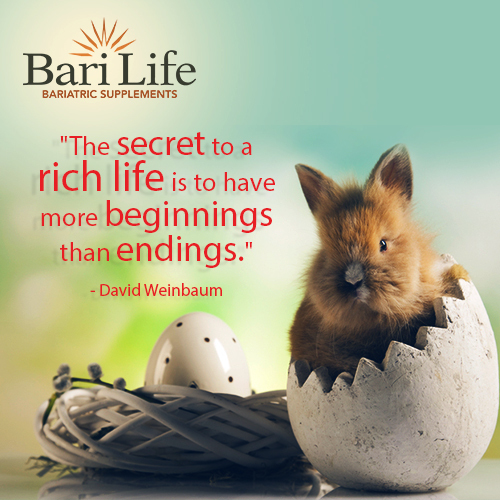 Bari Life Bariatric Vitamins and Supplements knows Easter is a special time of year for many people. While the thought of trying to prepare for Easter celebrations while juggling your daily exercise, healthy eating and bariatric vitamins routine may seem like a daunting one, Bari Life offers three tips to keep you on track through the holiday. And, of course, that doesn’t include all the delicious Easter dinner dishes and goodies. Whether you are preparing for weight loss surgery, just had surgery or are several months post-surgery, Bari Life offers three tips to help you stay on track during this fun family festive season. Portion control: when it comes to serving up meals, think in terms of balls: want pasta? Have a scoop the size of a baseball; in the mood for soup? Scoop up a billiard ball size into your bowl; desire dessert? Dish up a serving about the size of three ping pong balls. Add veggies rich in vitamins: a University of South Carolina study found that vegan and vegetarian dietary patterns can result in more weight loss than those that include meat without emphasizing caloric reduction. Consider making half your meals meatless and try new and tasty vegan and vegetarian recipes to add to your diet. Write it down: keeping a food journal is a simple and effective way to monitor your food intake and daily dose of vitamins. At a minimum of 34 words, people who kept a daily journal shed, on average, 12% of their starting weight. Easter’s just a few days away, giving you the opportunity to start implementing these tips into your daily routine. Taking your bariatric vitamins, along with adding more veggies, portion control and a food journal to your plan will help you achieve your weight loss goals.